The emperor knew that, along with the sun, the earth was also responsible for providing his people with a good harvest. Thus he knew that he needed to worship it in order to bless his farmers’ work. If, under his rule, there was a famine in his country, his position of power would be subsequently jeopardised. The Temple of Earth was built during the Ming dynasty (1530 AD), 110 years after the construction of the Temple of Heaven (1420 AD). For nearly five centuries, the emperors of the Ming and Qing dynasties used it to worship the God of Earth. 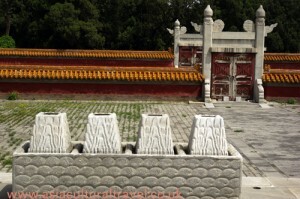 The largest structure in the Temple of Earth is the Square Stream Altar, which is surrounded by a moat. Two square enclosures surround the Square Stream Altar, and are painted red and surmounted with yellow glazed tiles. The altar is a two-tiered square terrace surfaced with flagstones. Its facade is covered with yellow glazed bricks. The emperor would go there to worship once a year, during the summer solstice (according to the Chinese lunar calendar). On important occasions, such as the emperor’s coronation, marriage and funeral, a representative of the emperor would come to report to the God of Earth in his stead. 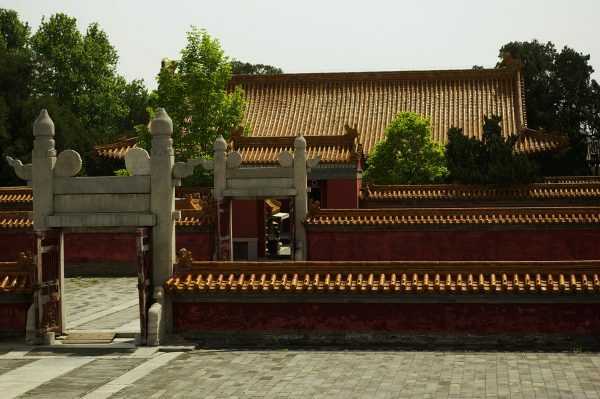 There is also the Temple of the Sun in the eastern part of Beijing, the Temple of the Moon in the western part of Beijing and the Temple of the God of Agriculture in the southern part of the city. All of these altars were built during the same year (1530 AD). The emperors worshipped the God of the Sun during the Vernal Equinox, and worshipped the God of the Moon during the Autumnal Equinox. When it came to worshipping the God of Agriculture, the sacrifice would normally take place at the start of spring each year.